You need permanent, easy access to all your building control systems (electrical junction boxes plumbing cleanouts, air vent dampers, etc.). Our innovative round drywall ceiling/wall access panel solves two key access panel problems with one ingenious circular design. Previously, cumbersome and hard-to-install square-shaped access panels were the only choice. No wonder Wallo’s easy snap-in, pop-out access panels for drywall ceilings and walls have become an instant success with DYI homeowners as well as the #1 choice for architects and contractors. 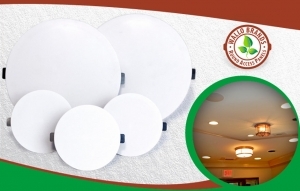 Attractive round access panels are designed to complement your home décor. Simple, clean and classic design can be painted, textured or wallpapered over to match perfectly with wide variety of decorating styles. Patent pending. Madison, WI. 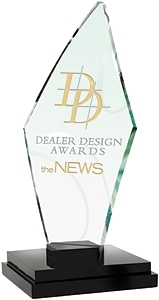 July 23, 2015 — Wallo Brands was recognized for excellence in product design in the 12th annual Dealer Design Awards Program sponsored by The Air Conditioning Heating & Refrigeration News magazine. An independent panel of contractors acted as judges in the contest that had 107 entries. 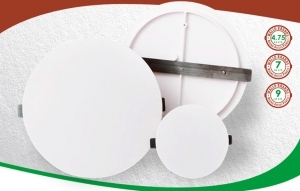 The company’s round shaped and spring-loaded circular access panel was the Silver Award Winner in the Miscellaneous category. The ACHR News is the leading trade magazine in the heating, ventilating, air conditioning, and refrigeration industries. Wallo™ is being manufactured and distributed by Wallo Brands LLC, located in beautiful Middleton, Wisconsin. We’re a forward thinking group of people specializing in creating innovative solutions for environmentally-conscious construction and remodeling companies as well as homeowners like you. We love working with companies that want high quality products and care about reducing carbon footprint by using eco minded products like our Wallo™ drywall ceiling access panels. Provide permanent access to ductwork air damper controls, electrical junction boxes. 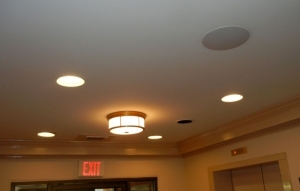 Work great as an in-ceiling and in-wall speaker hole cover, ceiling access panel. Attractive – can be painted or wallpapered to match any existing room decor. Our round access panels have been successfully installed in over 1,200 locations in the US and around the World.